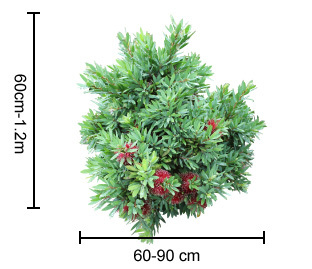 Description: A new Callistemon cultivar with blue-green toned mature foliage. New growth foliage has silver coloured tones due to soft hairy texture. 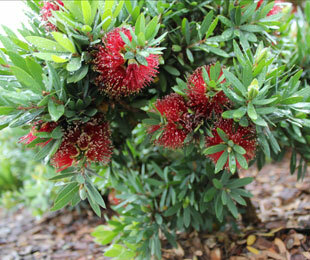 Will start flowering mid spring and finish late spring with small red flowers. Size: 60cm – 1.2m high x 60 – 90cm wide. Uses: Specimen and contrast planting. Position: Full sun to part shade. Suits sandy to well drained soils. Tolerates drought and cold. Care: Water as required for 8-13 weeks until established. Plant in a well mulched garden (chunky mulch is recommended). If required use slow release fertiliser in spring. If ever required prune every 3-4 years for a natural shape, or every 2 years for a tidy hedge. 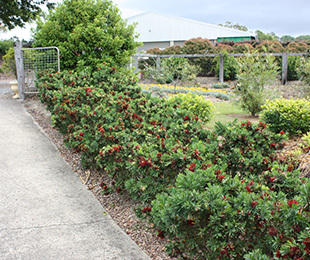 For more detailed information on Better John™ Callistemon click here.